Finishing your basement can increase the living space and value of your home. 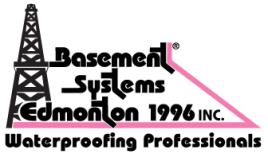 Basement Systems has seen tens of thousands of finished and unfinished basements with water problems ranging from dampness to all-out flooding. If you are going to finish your basement, this is what we recommend to prepare it properly. If you already have finished your basement, the majority of these precautions can still be made. Install an effective waterproofing system. 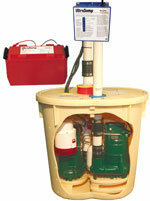 Install a reliable sump pump with alarm and back-up system. Guard against floods from frozen sump discharge lines. Install a vapor barrier on the walls before you put up finished walls. Protect against common plumbing leaks that ruin your finished basement. Perform some basic exterior maintenance. If the basement has ever experienced any groundwater seepage at all, then it needs a quality basement waterproofing system like WaterGuard®, DryTrak® or other options available from Basement Systems. The idea is that basement water problems never get better, they only get worse as the house ages and the drains and coatings that protected the house fail. Therefore, even if water seepage is a once-a-year occurrence, it needs to be fixed before the basement is finished, as flooding is likely to be more frequent in the future. Some cautious homeowners put in such a system even if they have not had seepage, just in case. This makes sense from the stand point that these systems are far easier to put in a basement that is unfinished than one where finished walls and floor coverings restrict access afterwards. It is also highly recommended that this system be installed around the entire perimeter of the basement. Before investing in finishing your basement, you should have the best sump pump protection available to guard your home against flooding from primary pump failure, pump overload from torrential rains, and power failure. Basement Systems' TripleSafe sump pump system stands ready with primary and secondary AC-powered pumps and a third battery-operated backup pump in a single airtight sump liner. TheTripleSafe system automatically pumps out water in the event that the power goes out or the primary pump mechanically fails to operate. Without this triple protection, your finished basement is only one pump or power failure away from a flood. Ensure a dry basement all the time with triple protection — before you invest in it. If you do not have a TripleSafe pump system and have a Basement Systems' SuperSump® instead, at the very minimum you should have an UltraSump® back-up pumping system and a WaterWatch® Alarm. The UltraSump® (standard with a TripleSafe system) is a battery-operated back-up pumping system with a DC pump installed in the same sump hole, a battery, and a charging system. The UltraSump® will pump up to 7000 gallons of water out of your basement in the event of the primary pump failing for any reason including power outages. A WaterWatch® Alarm is standard on all Basement Systems pump systems and will sound off to alert you to pump failure before your floor gets wet. If you have a sump pump, it probably discharges outside. Snow and ice can block the opening and cause it to freeze. When this happens your pump will be running and the water can't get out, causing your basement to flood. Basement Systems IceGuard, which is standard on most systems, will prevent this problem automatically. Basement walls can leak higher up off of the floor. Water vapor can also pass through basement walls and contribute to a higher humidity level in the basement. Installing a sheet of plastic, preferably a high-quality, extra-durable one will direct water seepage down to the drainage system below and keep it off of the studs and sheetrock or paneling. It will also keep water vapor from getting into the basement environment and lower the humidity levels. It is important that the vapor barrier be tucked into the drainage system below if one exists. The top of the vapor barrier should be caulked to the top of the wall. Even better, you can install a vapor-proof drainage sheet on the walls that will insulate, such as Basement Systems ThermalDry® WALL System, which reflects 97% of the heat back into your basement. Once you have eliminated any possible leakage problems in the basement, the next thing to eliminate is water vapor from coming through the concrete floor. Because concrete is porous, water vapor will slowly and continuously travel up through it. If you lay a carpet on top of the concrete floor, this moisture gets trapped under the carpet and causes odors, mold and rot in the carpet. Basement Systems solution is a ThermalDry® Basement Floor Matting system. This consists of a specially engineered polypropylene, 17-inch tongue-&-groove square tile that, unlike systems that use wood, is totally water and vapor proof. The unique grid design on the bottom of the tile creates an air space that insulates the floor and does not cause water vapor to condense. The installation takes away only 3/8' of precious ceiling height in the basement, instead of 4' for other methods. Any water leakage, whether it be from the ground or not, will have the same damaging effect on your finished basement. Basement Systems has easy solutions for common domestic water leaks, which we see all the time. The average life of a water heater is seven years, and when they fail, they usually leak and flood the basement. Basement Systems FloodRing® is the solution. The FloodRing® will contain water seepage and drain it to the waterproofing system when the water heater leaks. The SaniDry™ dries the air and automatically drains the water out of the hose, so you never have to empty it, like a conventional dehumidifier. The SaniDry™ takes three times the amount of water out of the air as a typical dehumidifier, yet uses the same energy. The SaniDry™ has a powerful blower to draw musty air in and move the dry, clean air back out into the basement. This unit helps to ensure that you won't have high humidity and musty smells in your finished basement. You should have your downspouts extended with Basement Systems RainChute® to keep roof water away from the foundation. Keep the soil graded away from the house wherever possible, and keep the gutters clean.